The need for specialist training in Kenya is huge. Very few physiotherapists are able to work with children with cerebral palsy. It is mostly the occupational therapists who shoulder the responsibility. Particularly in poor rural areas any treatment is hard to find and those few OTs who work with the children in these areas have often worked there for 20 years without ever having had the opportunity to attend a single course. 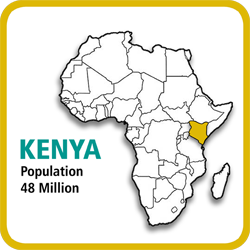 Cerebral Palsy Africa began teaching in Kenya in 2008 after receiving an invitation from Batul Chakera who founded the Cerebral Palsy Foundation in Mombasa. In 2009 we ran a course for therapists and another for equipment makers and a 2 day course for parents and this benefited physiotherapists and occupational therapists from the coastal region and further afield. It also enabled CPF to start making equipment for the children to use at home. In 2010 Jean Westmacott ran an equipment making course for the Tiwi Disabled Group on the coast for a small very committed group. Following this CPA has since run various courses in Nyahururu and Western Kenya at the request of other NGOs. 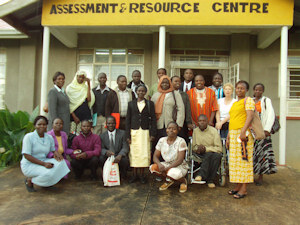 Our courses have mostly been in partnership with Kenyan NGOs such as St. Martins Catholic Social Apostate (CSA) in Nyahururu and the Educational Assessment and Resource Centre in Mumias in Western Kenya but we have also worked with the Association for the Physically Disabled of Kenya (APDK) when they asked us to run a two week course for therapists in Busia in Western Kenya in 2010. 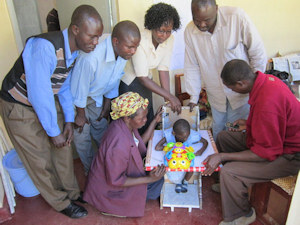 In November 2012, Cerebral Palsy Africa ran 6 different courses in the south-west corner of Kenya where therapists and others working with children with cerebral palsy have had no opportunities for specialist training. We had two very active and committed local partners, Martin Nafukho and Truphena Lumias who made all the local arrangements extremely efficiently. 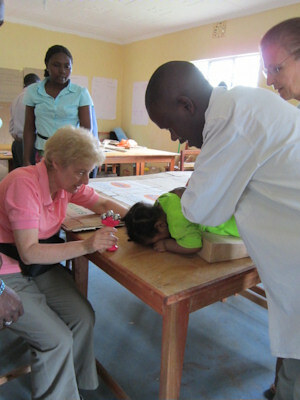 Martin is an occupational therapist who attended the course that CPA ran in 2010 in Busia, also in Western Kenya. He works in the Educational Assessment and Resource Centre (EARC) in Mumias. Truphena used to run a Community Based Rehabilitation (CBR) programme for Action Aid until Action Aid pulled out of Africa. Now she works as a volunteer and supports CBR workers in Malava. Started in 1984 in collaboration with the Danish government, 10 EARC centres for disabled children were set up around the country; Mumias was one of these ten. The centres were funded by the Danish government until 1997. When the Danes withdrew VSO took over until 2008 and sent 4 speech therapists to the original centre.